I’m so excited to work with your family! Please review the info. below, and complete the required fields in preparation for your session. Feel free to call or text with any questions you may have: 770-714-6724. Now that you’re booked, I’ve got your due date penciled in and I am somewhat “on call” to schedule your session shortly after baby arrives. If you are made aware of any changes to your due date, or an induction or c-section is scheduled, please let me know. Once your baby arrives, please reach out and I’ll nail down an exact date (typically Tuesday or Friday mornings within the first 2-3 weeks). If hair and makeup is included in your session, we will schedule this at that time and connect you with your HMU artist. Newborn sessions are shot in your home and last about 2.5-3 hours with a break to feed your baby. We’ll start with family shots and sibling shots so they can be on their way to preschool or nap time (usually about an hour into the shoot). If your parents are in town helping out, we’d love for them to jump in a few photos as well. Here are some important instructions for the morning of to make sure your session goes as smoothy as possible. 2. Feed or top off 30 minutes prior to scheduled to start time. 3. Leave baby wearing only a diaper and a tight swaddle. 4. Keep your home warm and cozy (at least 70 degrees). You won’t need to worry about what baby will wear as we’ll use our photo-friendly baby wraps to swaddle your newborn for the first portion of the shoot. For mom, dad, and siblings, we recommend planning wardrobe a few weeks before your due date so that you look and feel your best. Take the backdrop into account. If you have lots of color or decor in your home, stick with a more neutral or complementary palette. I love dark accent walls! If you have a neutral home with light-colored walls and minimal decor you can spice up your shoot with a floral, pattern, or fun color scheme....or you can keep it all neutral to accomplish those light and airy monochromatic photos. The lighter the color palette, the lighter your photos are going to turn out. Choose fabrics that are interesting to the eye - lace details, embroidery, sweater/textured materials, chiffon, and sheer overlays that may allow window light to pass through. Stay away from unlined tops and dresses and clingy knit fabrics. Dads can get away with a button down (with rolled sleeves), sweater, or even a v-neck t-shirt (my fave). My only suggestion here is that Dad doesn't wear a polo or look like he's at an office meeting - no dressy slacks please. And toddlers can follow these same rules as long as colors coordinate...they're gonna look cute no matter what, right? The most flattering styles for right after baby are flowy maternity tops and dresses, and if you're going the pants route, maternity pants or jeans. Some of my moms rock their post-baby bumps a la Kate Middleton, and some choose to wear undergarments like Spanx. If you don’t have professional HMU included in your session, we highly recommend scheduling this on your own (we’re happy to send you names!) or allowing plenty of time to do your own hair and camera-ready makeup. Let your little ones know this is going to be FUN! We’ll sing and dance and talk about their favorite characters. They’ll get extra special snuggle time with mommy and daddy and even get to hold the baby. Please do not instruct your children to “say cheese” or smile. It’s my job to get those natural smiles out of them, so I’ve got a few tools in my tool belt. To avoid little ones getting overwhelmed, I ask parents to please let me provide the direction to big brother or sister. Make sure little ones are well fed before we start. Snacking or bribing with treats during the shoot ends up being a tough distraction to move away from. In the same sense, I ask everyone to always default to looking at baby and each other and when I need you to look at the camera and smile, I’ll ask. Hands should always be accounted for so if there’s a free hand, put it on someone else or put it in a pocket with thumbs out. I want your shoot to look and feel as relaxed as possible so feel free to crank up your family’s favorite playlist (not just your toddler’s favorite, but something dad will enjoy too). Your online proofing gallery will be emailed to you 3-4 weeks after your session date. Our studio manager, Emily, will work with you to select a digital/print package and is happy to help with handle invoices and gallery delivery once payment is received. 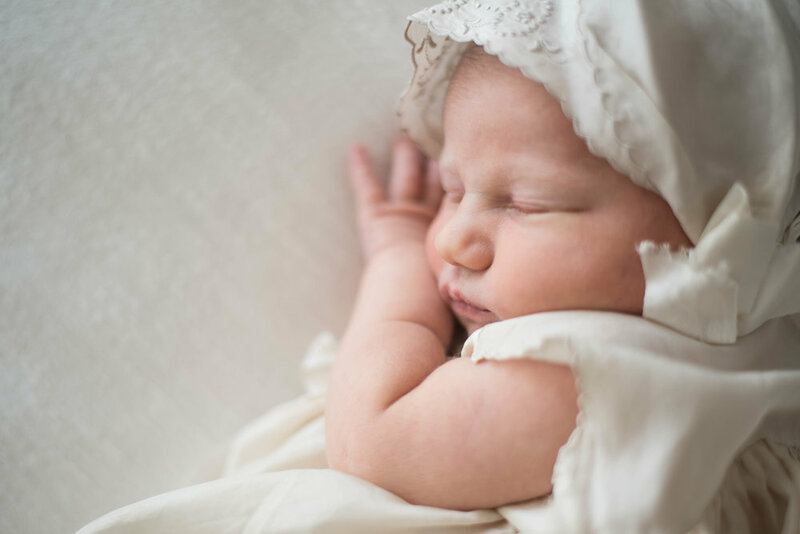 If selecting Package 1, your newborn box or framed print will be received about 3-4 weeks after making your selections.